When I was about eleven, I had a pen-pal. 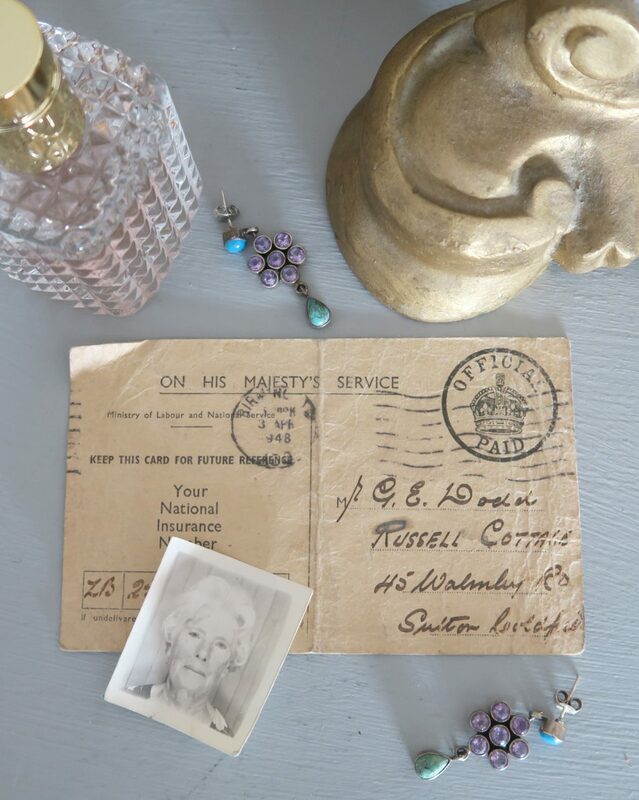 These days, the term ‘pen-pal’ is probably obsolete. In this digital age, people tend not to use pens to write letters any more. Emails are the preferred method of communication. My penpal was Italian. She had long dark hair, tied back in a sleek ponytail and in the photo she’d sent me, she wore a sea-green sweatshirt . I can’t even remember her name — it was such a long time ago — but I used to love receiving her letters in the post. They used to contain news of her life, little Italian treats — stickers, scented rubbers or tiny sweets — and basically, in an age where there was no internet, email or social media of any kind, they gave the most enticing glimpse into the life of someone I barely knew. Digital communication is good — amazing in fact — but these days everything is so immediate. You can post how you feel — for thousands of people to see — and even have a face-to-face conversation, in real time, with someone who’s thousands of miles away. It’s the kind of technology they used to talk about on Tomorrow’s World. Only now, it’s not ‘the future’, it’s the here and now. Nowadays, there’s something utterly charming about an old fashioned letter. So imagine my excitement when, last month, I received an intriguing box filed with the loveliest treats from my blogging friend Fionnuala, who lives in Germany. She’d sent me a bag filled with fresh walnuts from the tree in her garden, a little parcel of chocolate covered marzipan (something we had a lengthy Twitter discussion about last Christmas) and a can — yes, a can — of Prosecco. A running joke and something that doesn’t seem to be widely (if at all) available in the UK. I thought it was an urban myth until I opened the packaging!! But I can now confirm that it does exist — and also tastes very good! I’d no idea that my friend was sending this little package of loveliness and it was such a treat to receive it. Funnily enough, I used to take part in an organised gift swap which was very similar. The difference being that you had a good idea that someone was sending you something — albeit not what they were going to send. Weirdly enough, opening this little box of treasures transported me back to being eleven again. Coming home from school to find a letter from my penpal. In this immediate, digital age, it’s not often we receive lovely and exciting surprises. So thank you Fionnu. Thanks for being so thoughtful and taking the time to send such a lovely selection of little treats through the post. It made my entire week. 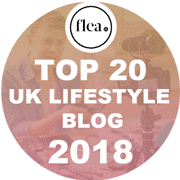 Well, we’re very nearly reaching the close of this month and I’ve only just got around to writing my styling the seasons post. But hey. I’m consoling myself with the fact that at least I’ve done one this month!! I missed June’s completely!! 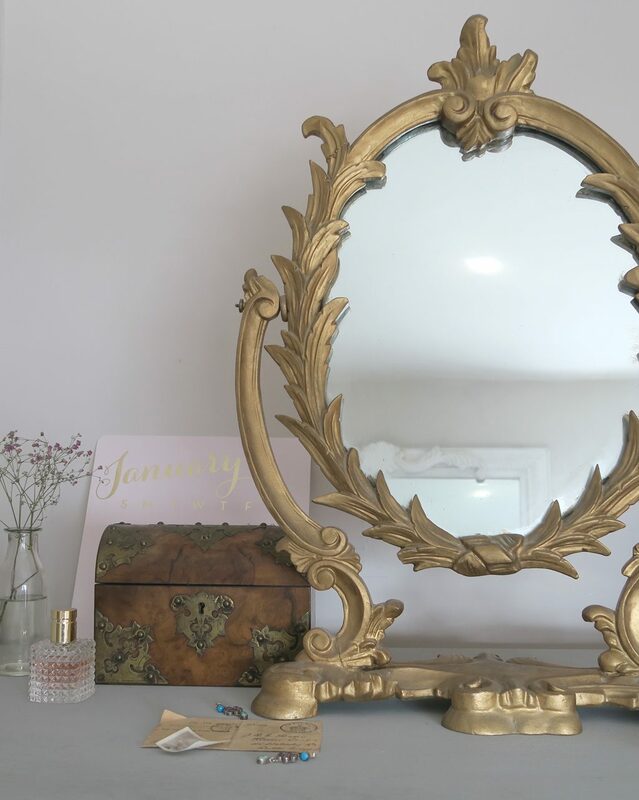 I was recently sent a mini greenhouse from the lovely interiors company Rose & Grey and asked to style it as part of their blogger’s styling challenge, so it seems a wise move to combine this with my styling the seasons post for July. 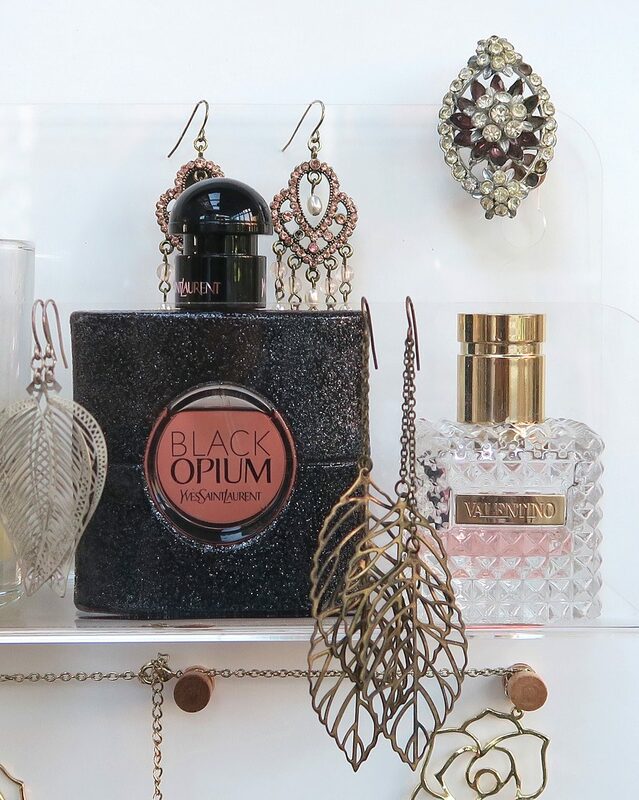 It’s such a sweet little object — almost like a miniature display case in a museum — and just begs to be filled with all sorts of treasures; jewellery, books, shells. I think, eventually, I’d like to put tiny succulents in it. 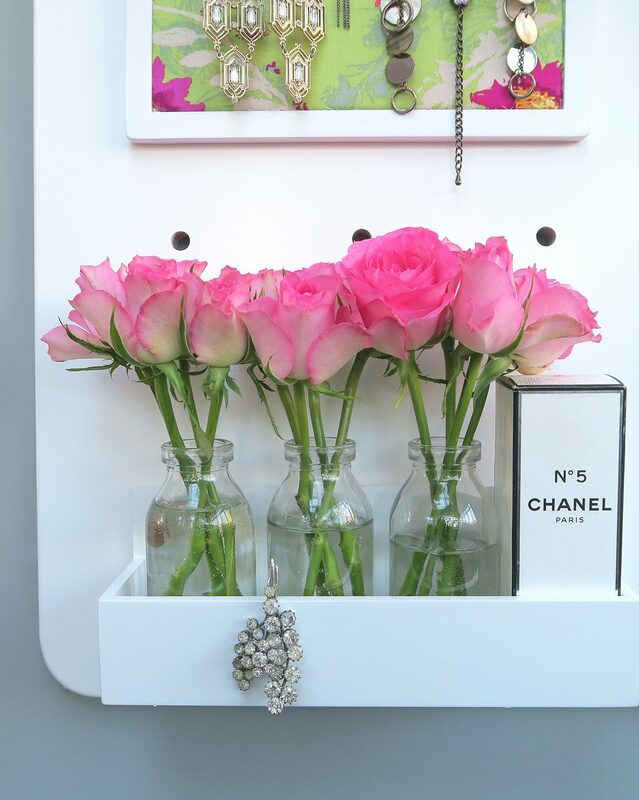 I’ve been pinning away and you can get some really beautiful ones. 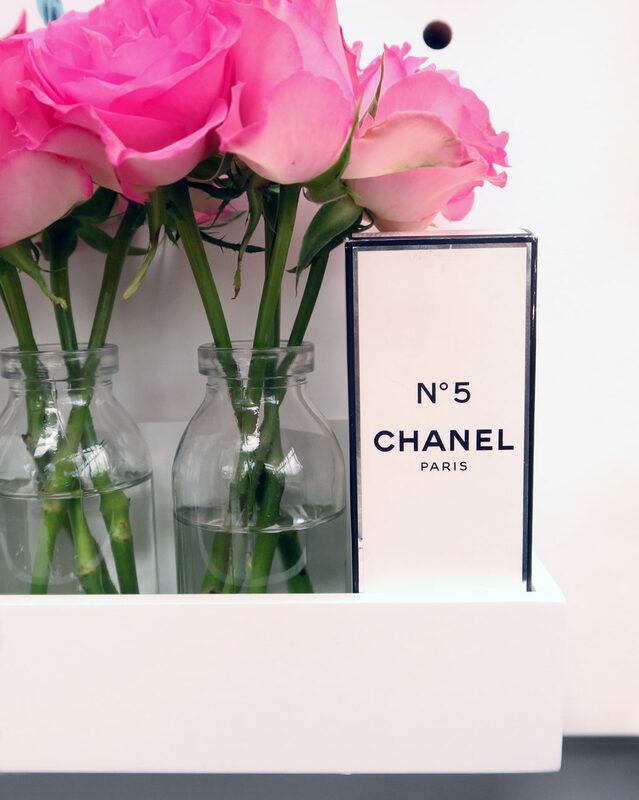 So perfect and dainty. 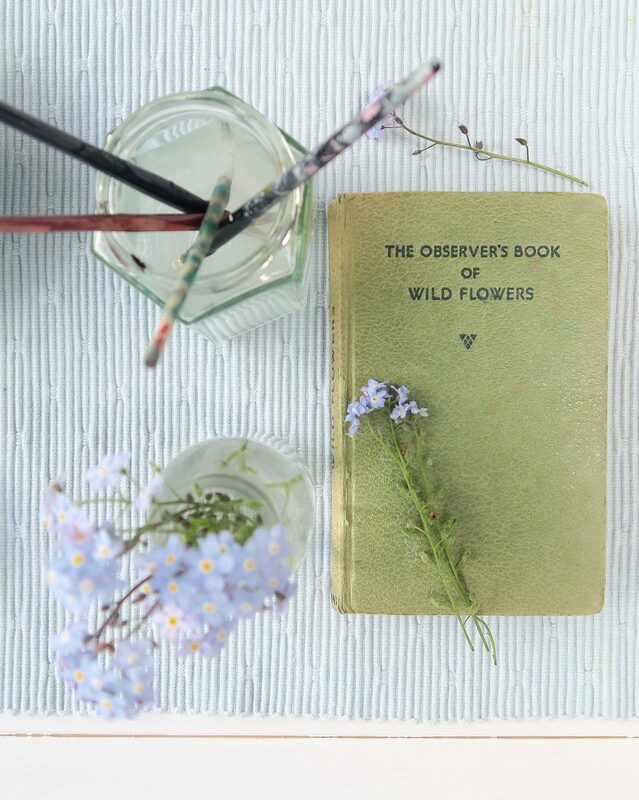 I was obsessed with tiny, miniature gardens when I was a little girl. I loved our village show, where they had a ‘garden on a plate’ competition. 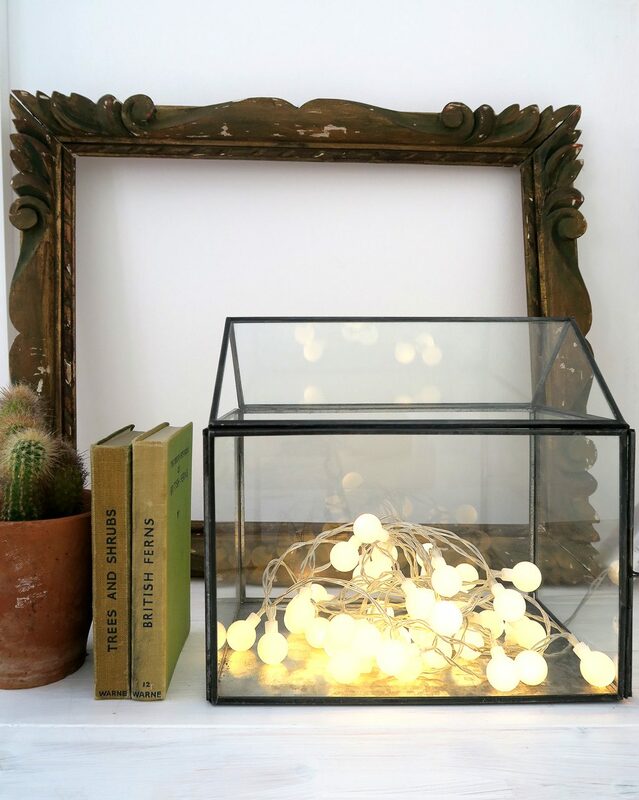 When I have more time, I will create a gorgeous garden inside this little glass house. But that is most definitely a project for another day. 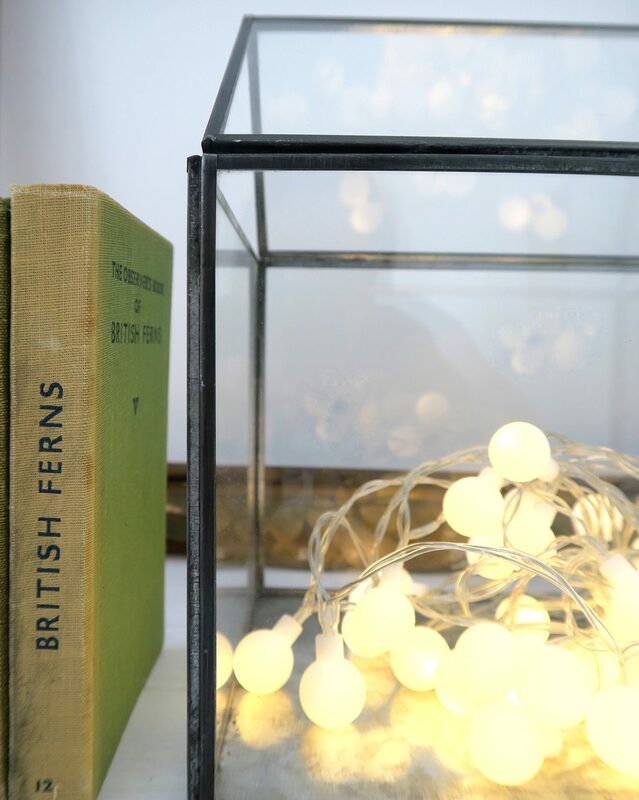 So, for now, my very favourite thing to fill it with is fairy lights. 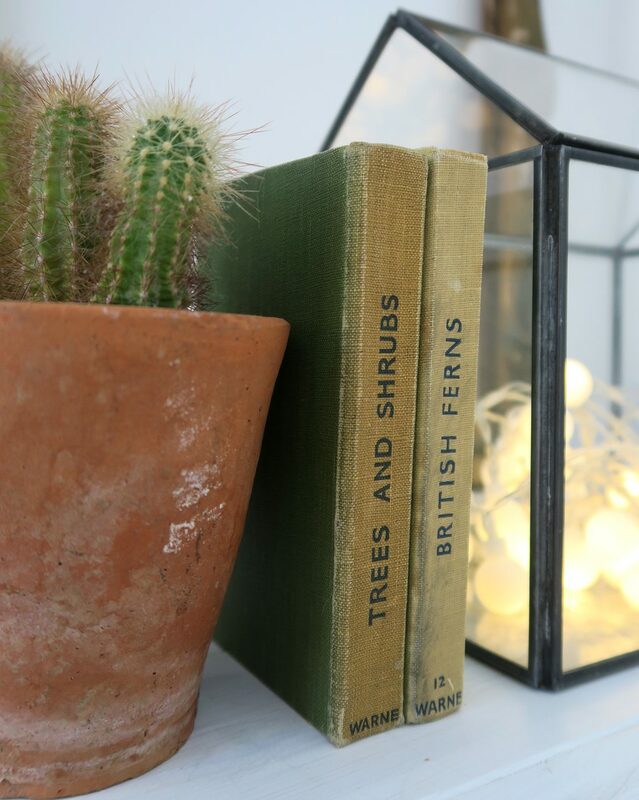 Because until I can get around to buying coloured sand, pebbles and tiny little cacti and succulents, this little greenhouse makes the perfect nightlight. All photos, thoughts and words are my own. I’ve spoken before about my love of gardening. I guess it’s in the blood. My paternal grandmother was notoriously green fingered — as was my maternal grandfather. He was a really keen gardener and when he died I asked for a couple of rhubarb plants from his garden. I’ve written about the homemade rhubarb cordial that we make with the spoils each year and, this year, we’ve also taken over an allotment. Even more scope for growing things! 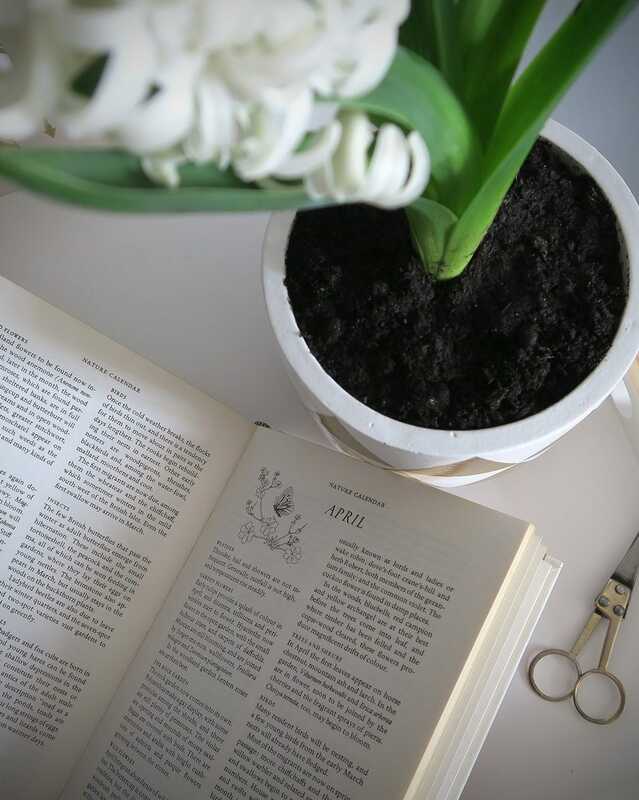 Now, I say ‘I have a love of gardening’ — and that’s true — but if I’m being 100% honest, I rarely do any of the grunty stuff. My boy is head gardener in our household, without question. He spends hours out there. Growing little plants from seed; tending them until they’re hardy enough to be replanted outside. Oddly, he’s not normally one for solitude. If he’s left in the house by himself, for any reason, he has to go out. To the pub/shops/for a round of golf; anywhere where there’s other humans and the possibility of a conversation. So I find it weird that, since my gorgeously gregarious husband has caught the gardening bug, he’s happy in the company of his plants and the local wildlife. With father’s day coming up in a few week’s time I thought I’d get him something to keep him company whilst he’s digging in the allotment. 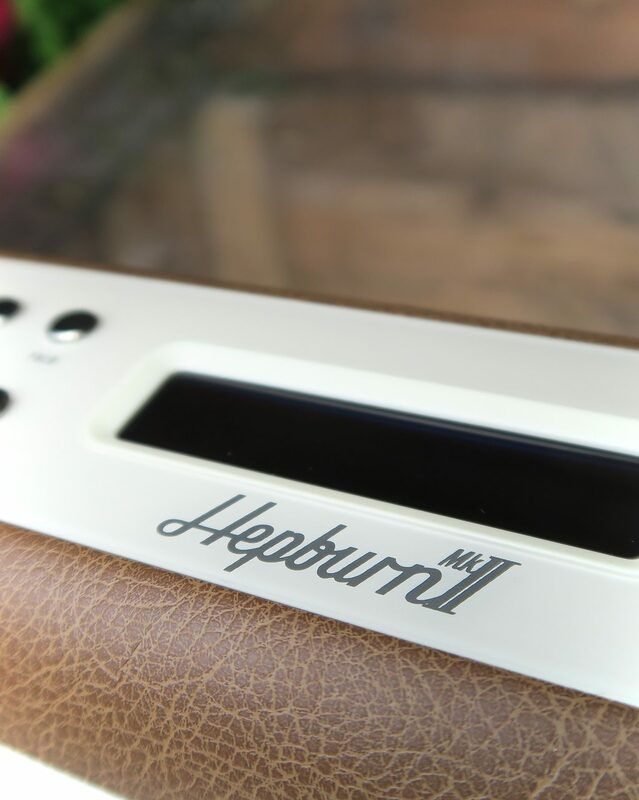 Enter the Hepburn Mark II radio by View Quest. 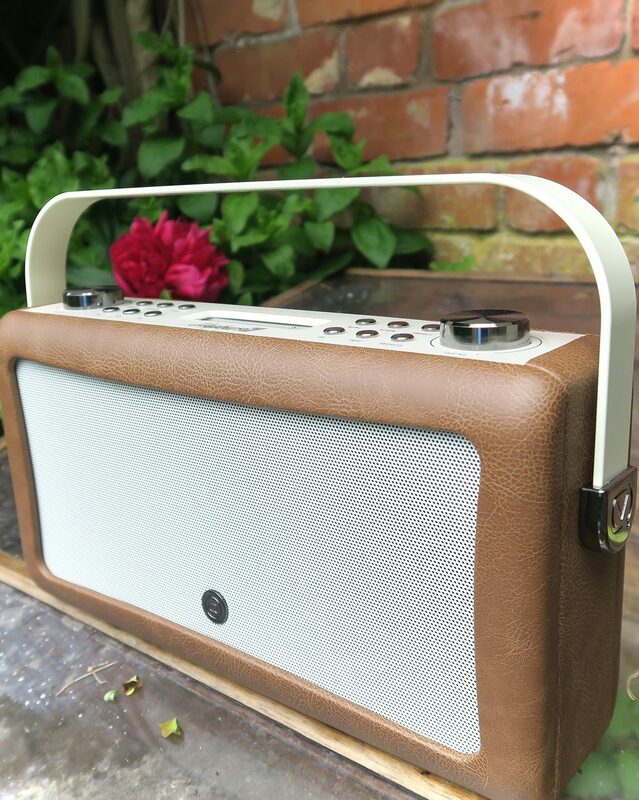 With gorgeous retro styling, this little beauty may look like an old fashioned kind of chap but with DAB, DAB+ and FM radio reception it’s beautifully styled exterior houses the most cutting edge technology. 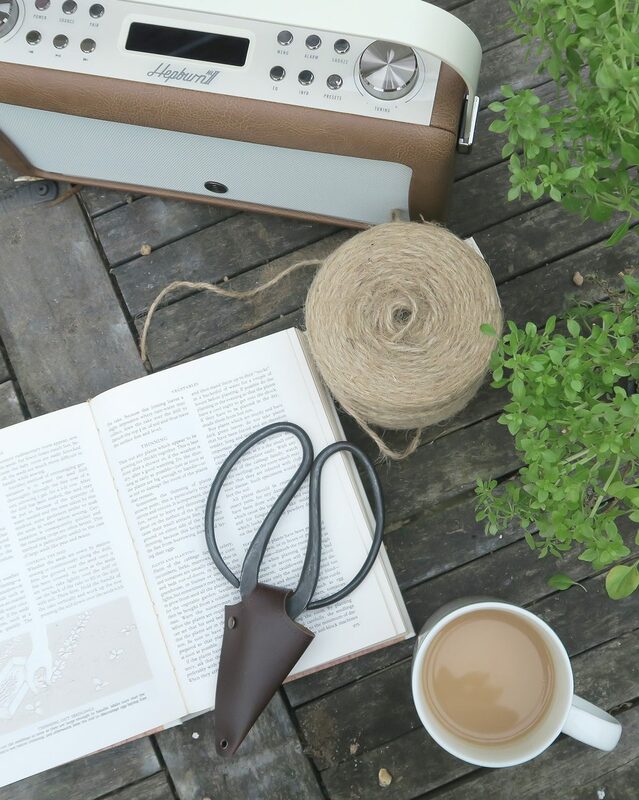 It means that my green fingered boy will be able to access the full range of digital and analogue services across the UK — and Europe — whether he’s at home or in the allotment. And if he doesn’t have access to the mains, he can also use batteries to power it. PLUS he can play his own music library, simply by connecting it to the iPad or phone via Bluetooth or with the inbuilt aux-in connection. 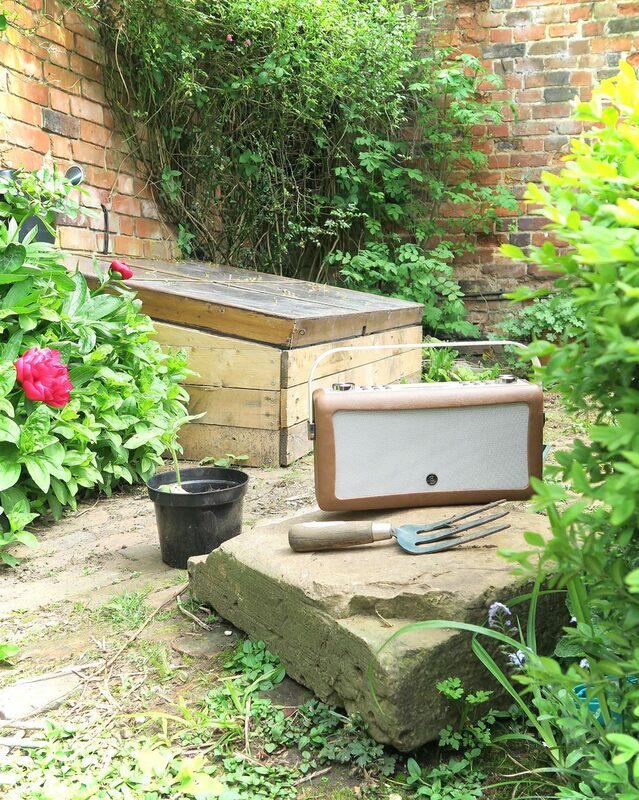 I’ve got my own VQ radio that keeps me company whilst I’m working and I absolutely LOVE it. Mine’s the VQ Retro Mini — in an Emma Bridgewater polkadot print — but I’ve chosen a gorgeous brown leather version for my boy. 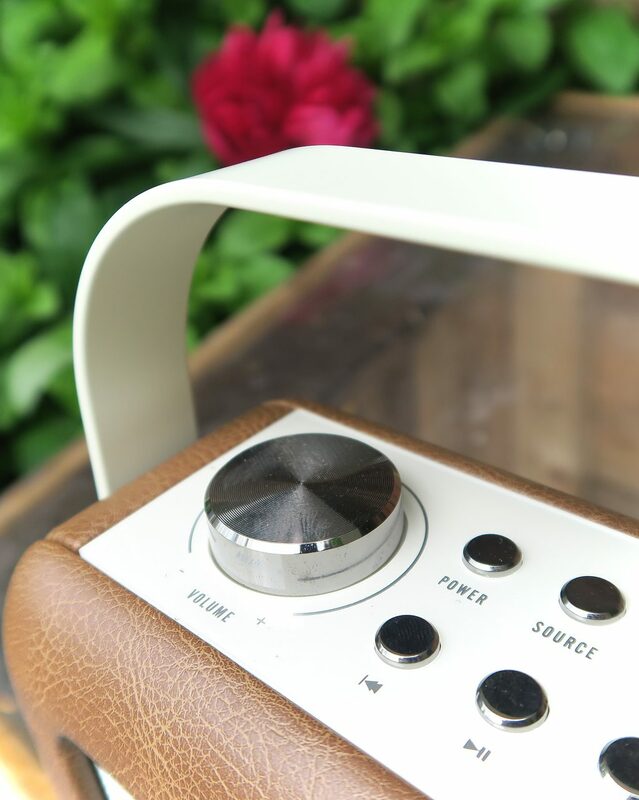 The Hepburn Mark II radio is the perfect kind of gift for father’s day! Makes a lovely change from socks — or aftershave — and is such a fab, thoughtful, present (for men of all ages). It’s available in 11 gorgeous block colours and 5 Emma Bridgewater prints. You could choose masculine black or antique brown leather — like the one shown here — or even pick British Racing Green or cherry red, to go with their car! 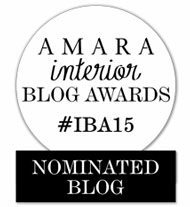 This is a collaborative post but all thoughts, words and images — as ever — are entirely my own. 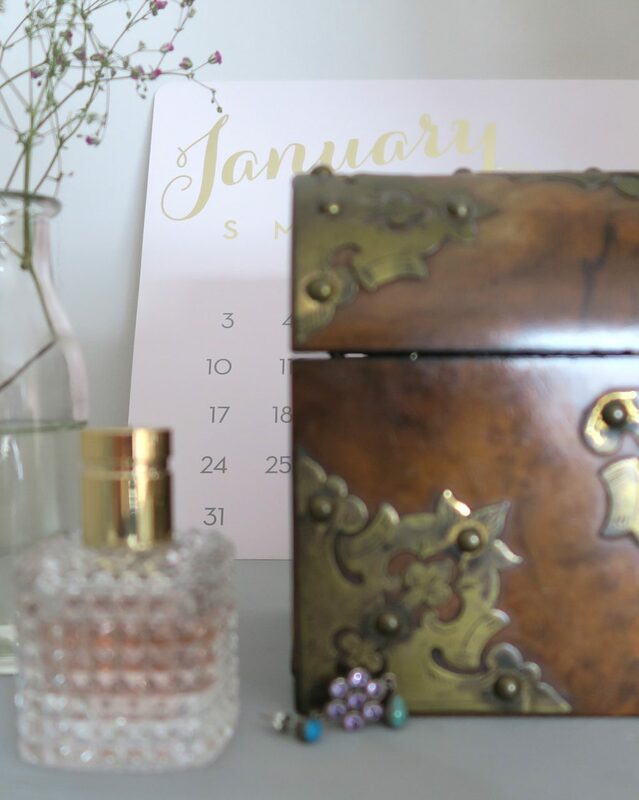 At the beginning of this month I felt so ridiculously bogged down by everything. Too much to do and not enough time. And the inability to get a grip on the situation — and manage my time effectively — was addling my brain and making me feel a bit miserable. Amazingly my lovely friend Leigh — who writes the award winning blog Headspace Perspective — is also a qualified life coach and had just set up a new business called Bright Mind Spirit. 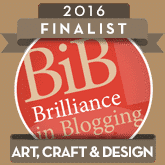 She’d offered a handful of bloggers an hour long session each and I was lucky enough to be picked. She told me that coaching can often show us that we have the answers to our own problems. It couldn’t have come at a better time. We discussed so many things and at the end of the session my head felt much clearer. It was like mentally trying to unravel a knotted and tangled ball of string. Initially, I had no idea where to even start. 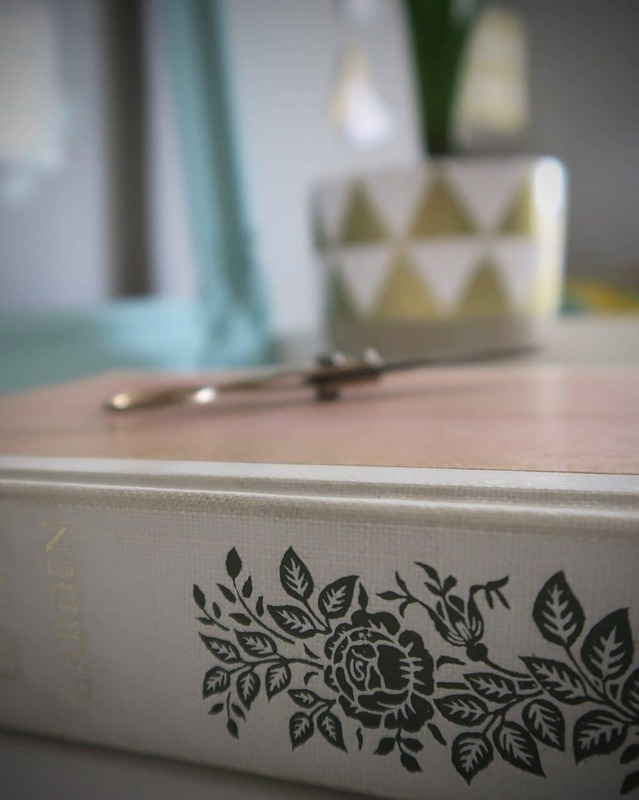 But throughout the session, everything started to become a little clearer and I could see that making small changes would make the world of difference to my work/life balance. I made promises to be a little kinder to myself — cut myself some slack — and take time-out of my working week to occasionally s.t.o.p. So, as May has tumbled on, I have done exactly that. My workload hasn’t lessened but I’ve certainly felt as though I have a better handle on everything. Putting work aside for half an hour, a couple of times a week, has given me a little more clarity. Given me time to breathe and take stock. 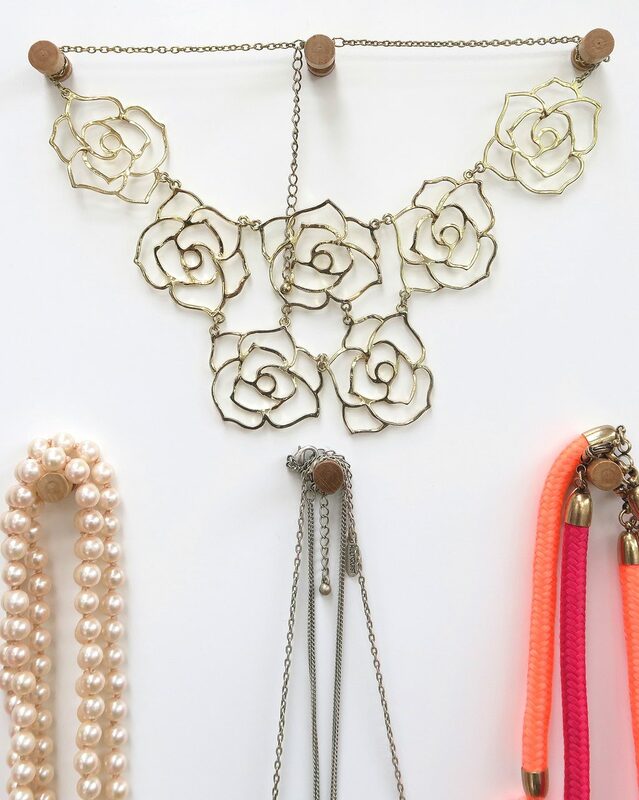 And my styling the seasons post this month is sort of a bi-product of that. 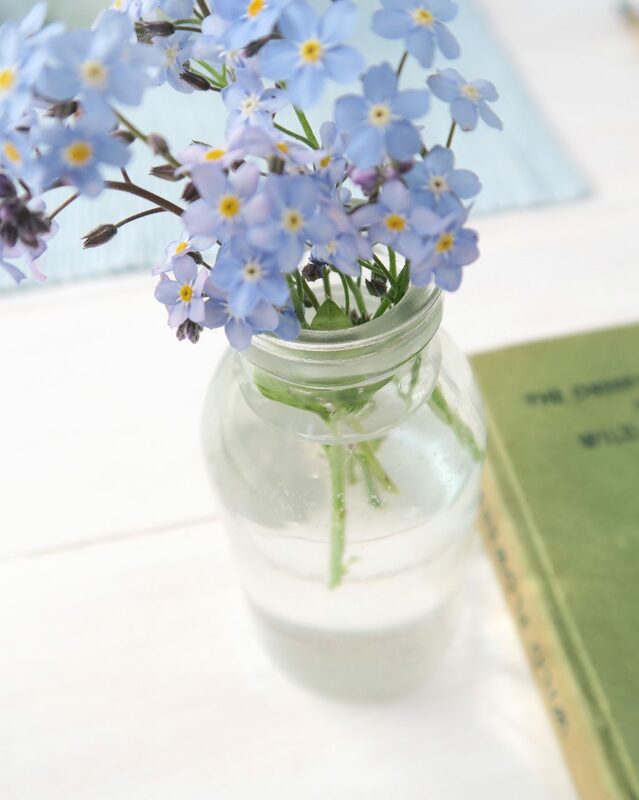 I picked some Forget-Me-Nots a few days ago — put them in a little bottle of water and popped them on a shelf. They’re so pretty. 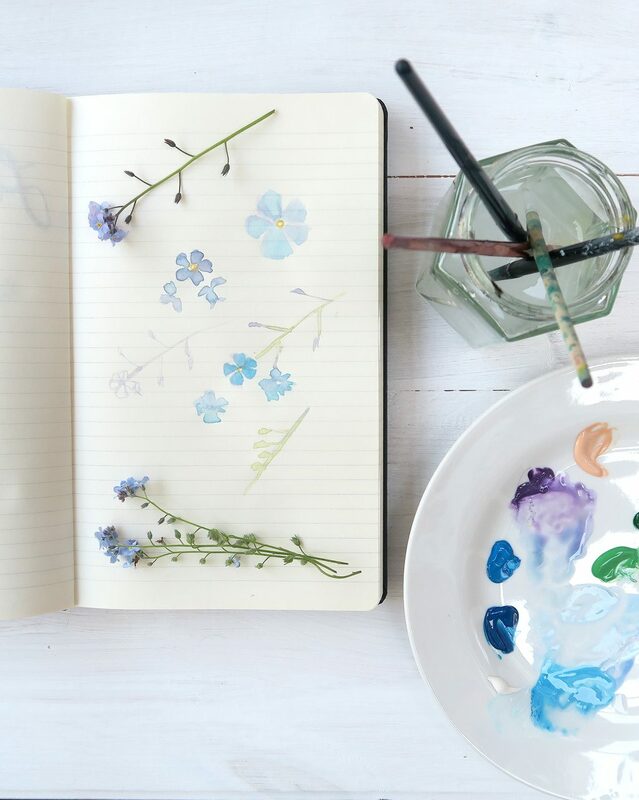 Papery thin; sky blue and lilac petals. Some of them tinged with blush pink or mauve. A golden eye in the centre of each flower, almost like a little star. I decided to paint them. I’ll never be a good painter but I love the process. So nice to focus your mind and concentrate on the brush strokes. 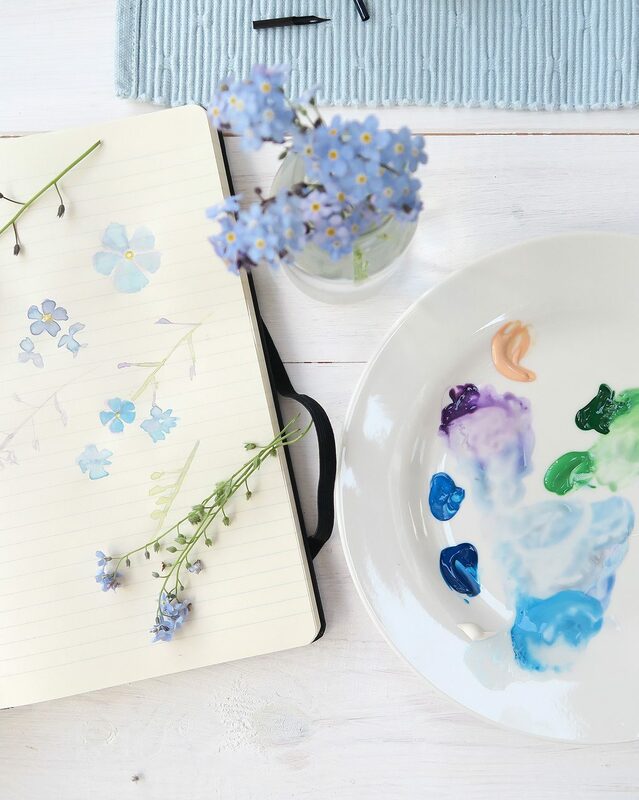 Lovely to watch how the paint merges with the water and settles into the paper. It’s a great way of pushing out unwanted thoughts and giving your mind a little breather. 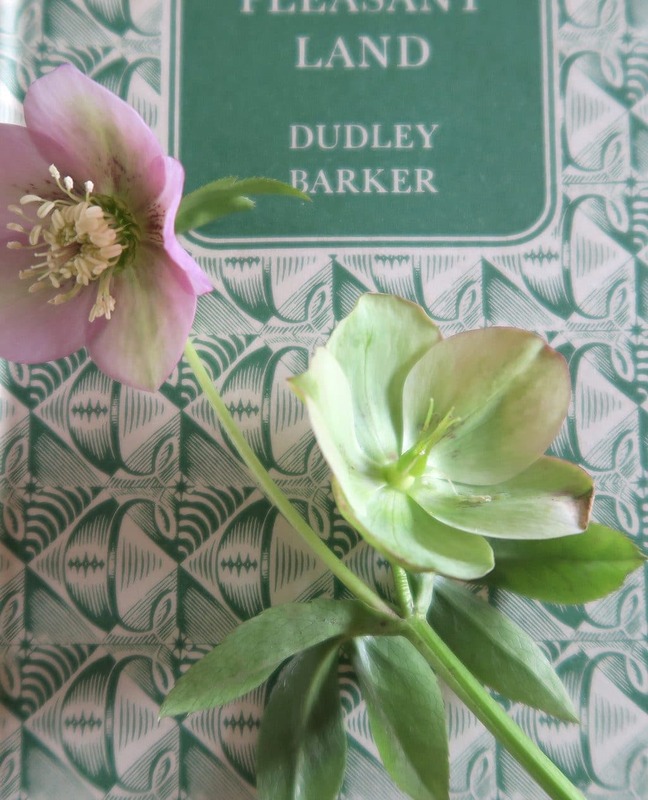 And as I sat there, concentrating on the little flowers and their spindly stems, I thought about the last few weeks. I remembered that this month marks the first anniversary of my nana’s death. And in just four day’s time, it will be the fifth anniversary of my lovely grandad’s passing. And that same date marks a full twenty years — to the day — that my beautiful boy and I got together. 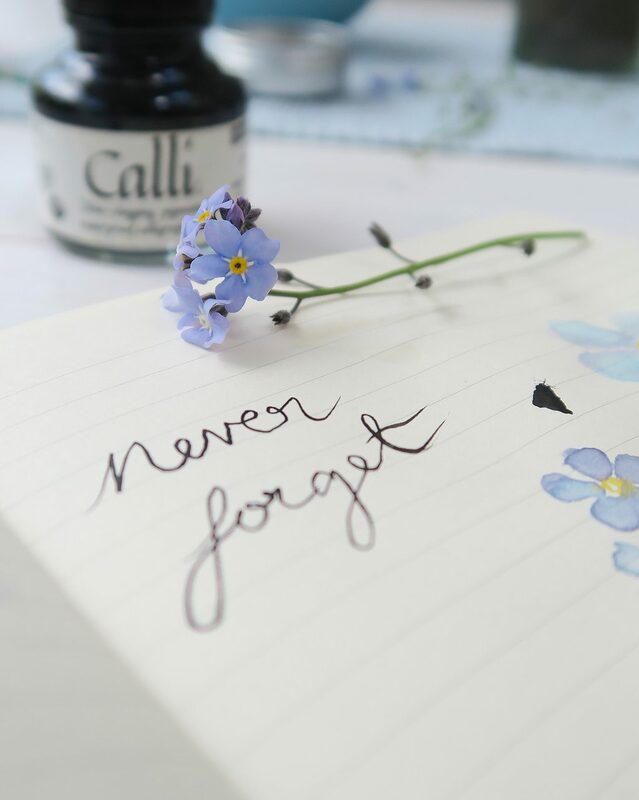 And it struck me that it’s the month of May — which was my Nana’s middle name — and I’m painting Forget-Me-Nots and thinking about them. Many thanks to lovely Leigh for giving up an hour of her time and, in doing so, giving me back my perspective. 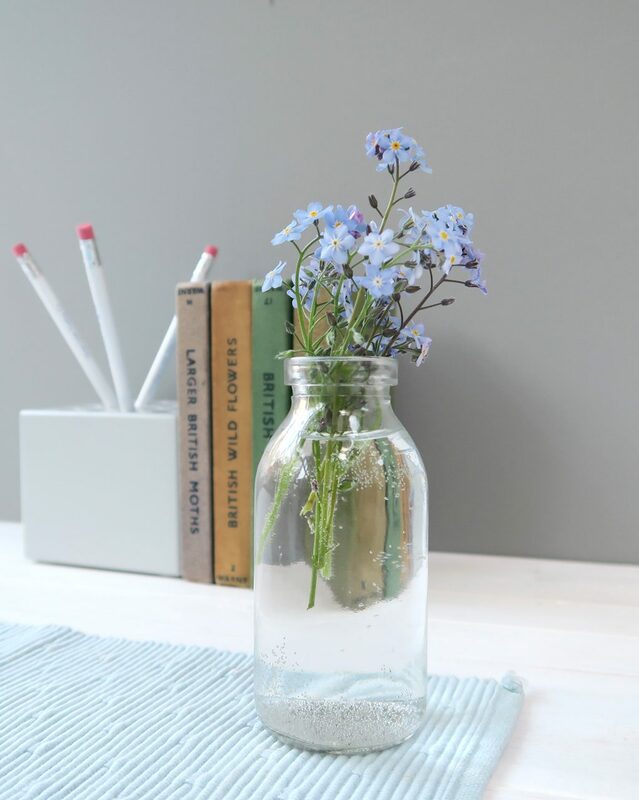 If you feel as though you could do with a little bit of help finding your focus, pop along to Bright Mind Spirit and have a chat with her. I highly recommend it. 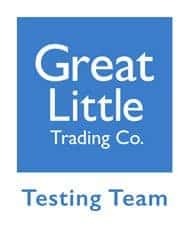 I’ve already mentioned in a previous post that this year our family are fortunate enough to be part of the testing team for the Great Little Trading Company. It’s a company that I’ve genuinely always loved and it’s fab to be able to say that we’re part of their family. 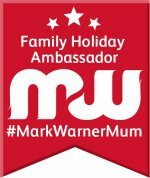 They’re a really lovely company to work with, they offer fantastic work, rest and play solutions for children and the quality of their products is fabulous. 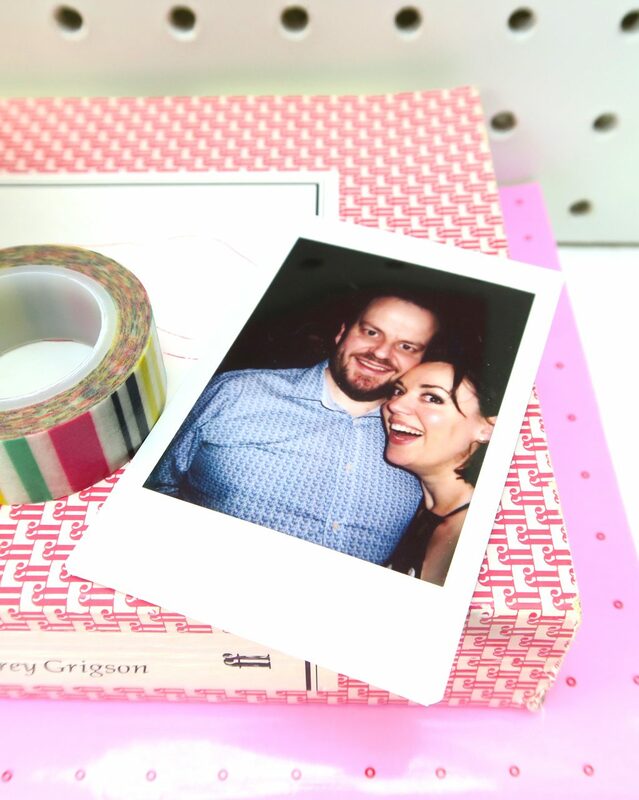 Plus I’m really excited to share our thoughts on the products we’re testing. As with anything I ever write on my blog, I promise 100% honesty at all times, so you’ll be getting a genuine opinion. 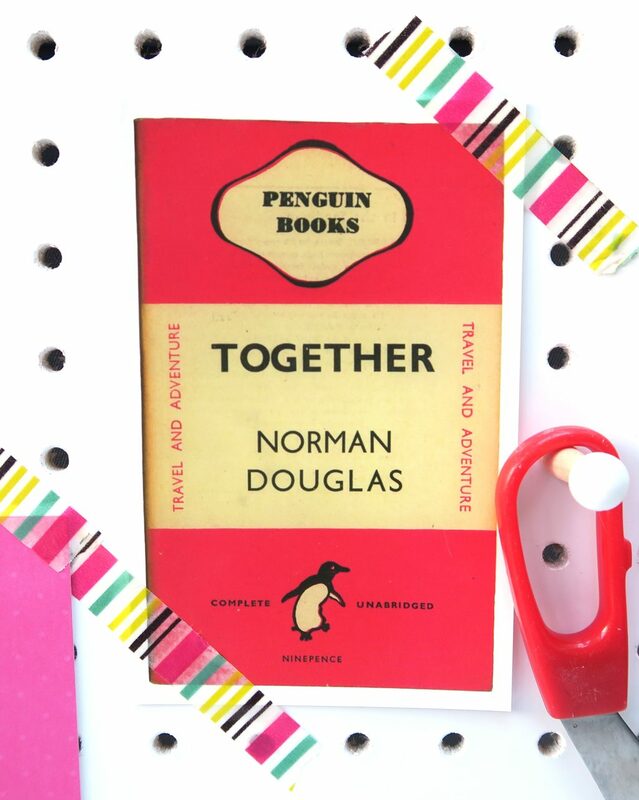 So far, we’ve focussed on the little star book ledges and been very impressed with those. They’ve fast become part of a little bedtime ritual for the boys; favourite books, sippy cup and a selection of animals are all carefully placed in each shelf before they go to sleep each night, in readiness for when they awake in the morning. But the next thing I wanted to share with you is something that’s ambiguous in who — and what — it was designed for. It’s a pegboard wall organiser. Aah — office — I hear you cry. And yep — you could be right. It would work beautifully in an office. 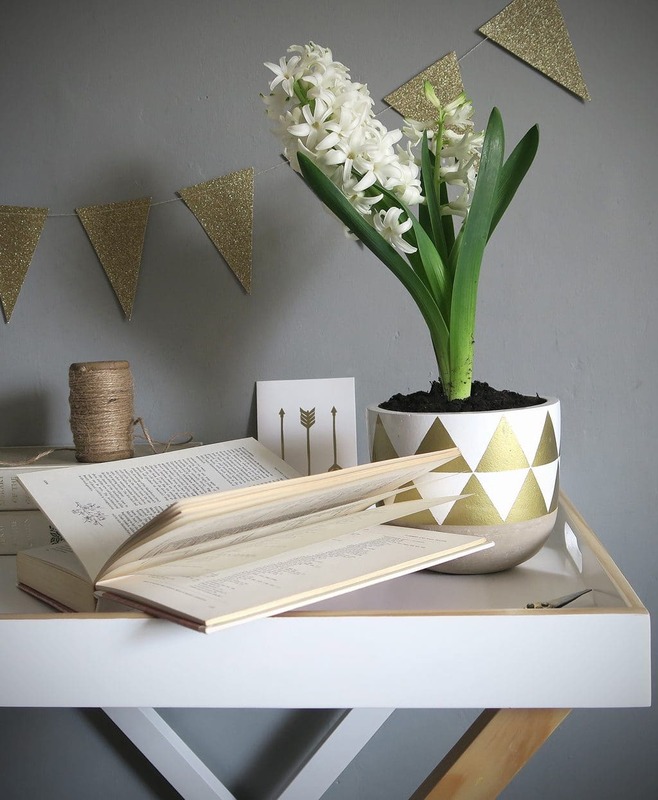 It has a pen pot and a stationery ledge plus all manner of other nifty little features that would be perfect in a home office or study. Again, it would be really, really useful in the kitchen. It comes complete with a cork-board for timetables and receipts — plus a little chalkboard for reminders or love notes (whatever takes your fancy on whichever day). But it’s so super stylish that I *guarantee* if this graces your home — even though it’s been designed for the younger members of our families — you’ll covet it for yourself and will eventually steal it. 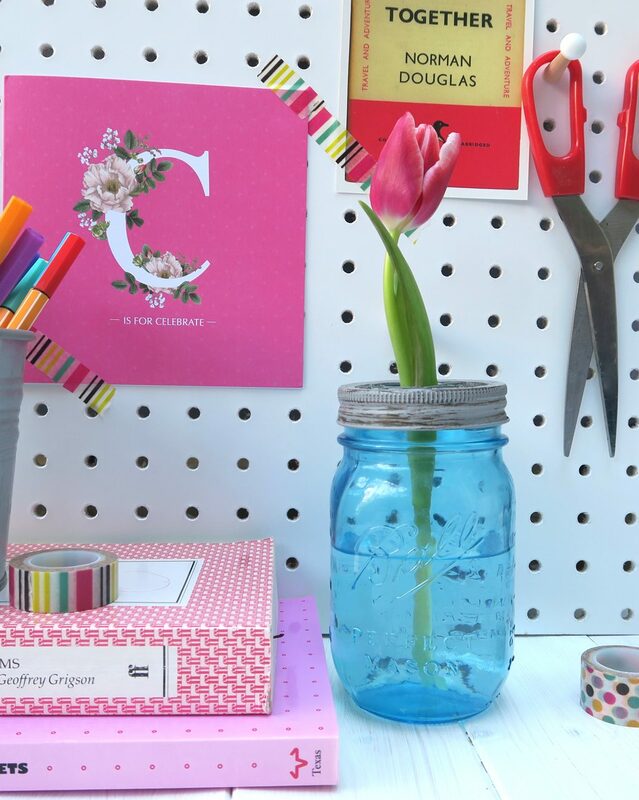 Because, friends, this isn’t any old pegboard wall organiser — oh no. 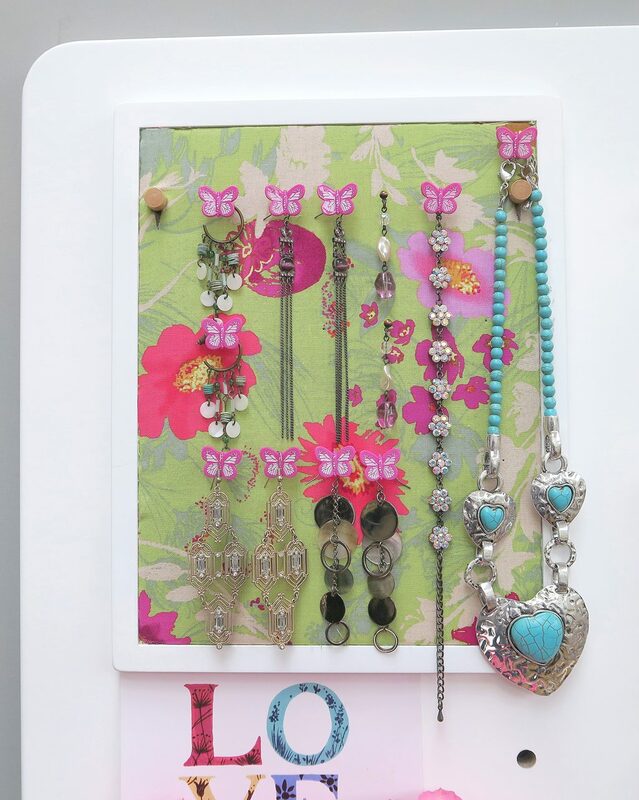 This pegboard wall organiser can be styled any which way you like and will happily sit in any home environment. My boy saw it and immediately claimed it it for his shed; *apparently* he could keep seed packets, string and other bits of gardening paraphernalia in it and write his planting schedule on the blackboard. I, on the other hand, had other ideas. My dresser top is usually a mass of bottles and a tangle of jewellery — not the good stuff, I’ve very little of that — but I’m a massive fan of costume jewellery and seem to have amassed quite a lot of it, over the years. 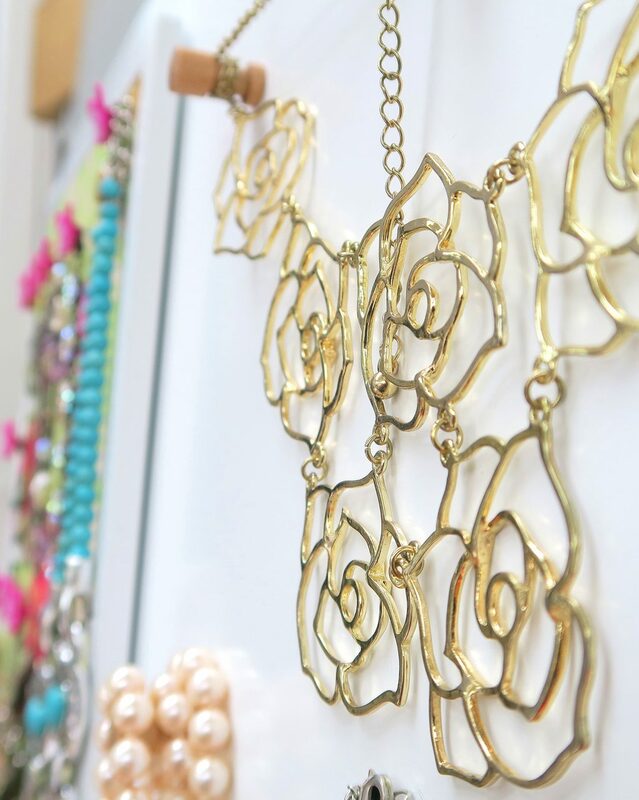 As a result there are huge knots of necklaces or little piles of earrings, littering the surface. 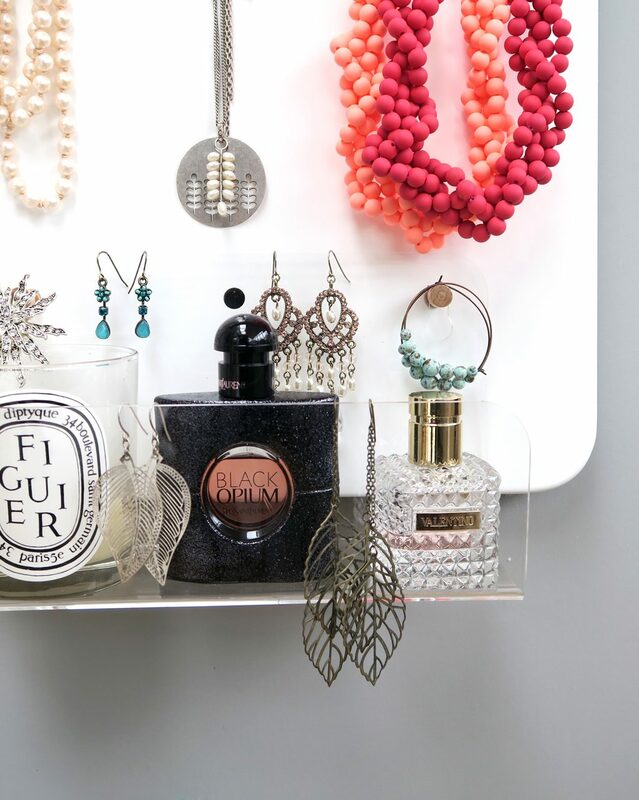 You see, this Great Little Trading pegboard wall organiser is a master of disguise. 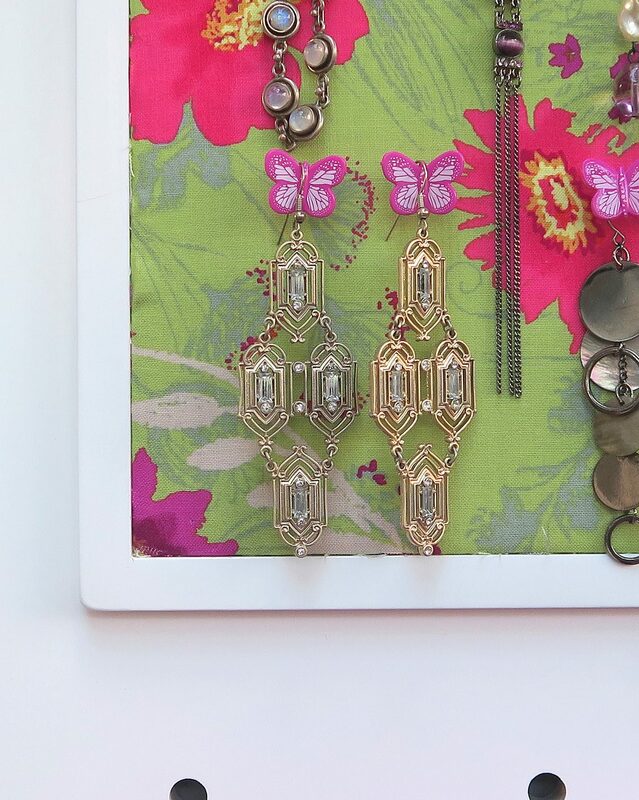 Whilst it’s the perfect addition to a child’s bedroom, home office, family kitchen — or even a shed — it also makes the most amazing jewellery tidy. I covered the cork-board with some fabric that I’d received in the goody-bag at last year’s Britmums conference. Really simple — no sticking or gluing involved — I cut the fabric to a couple of mm larger than the cork, then tucked the edges down between the cork and the frame with a ruler. 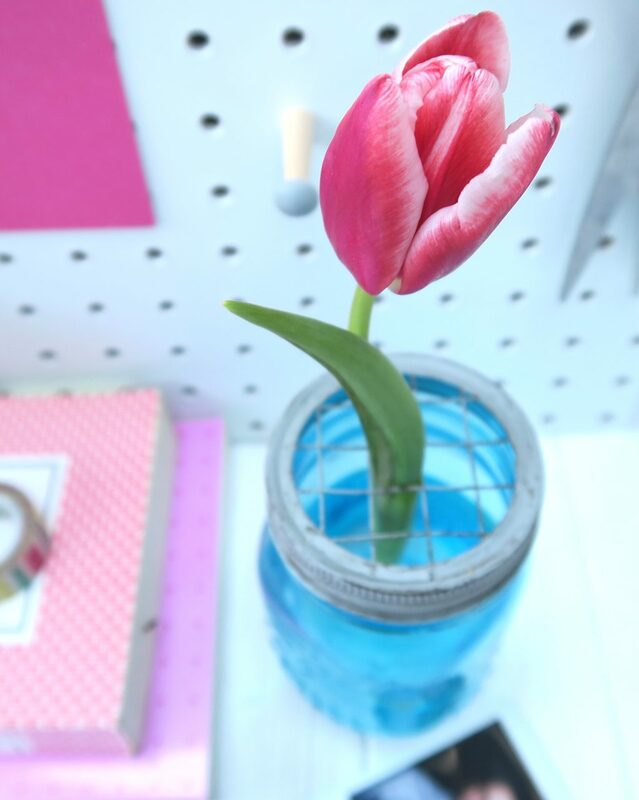 Super-easy and gives the pegboard a lovely feminine look plus — because it’s not glued down — it can be taken off when someone else steals the pegboard for their shed own use. I used little butterfly pins to secure my earrings to the cork and Bob’s your uncle. 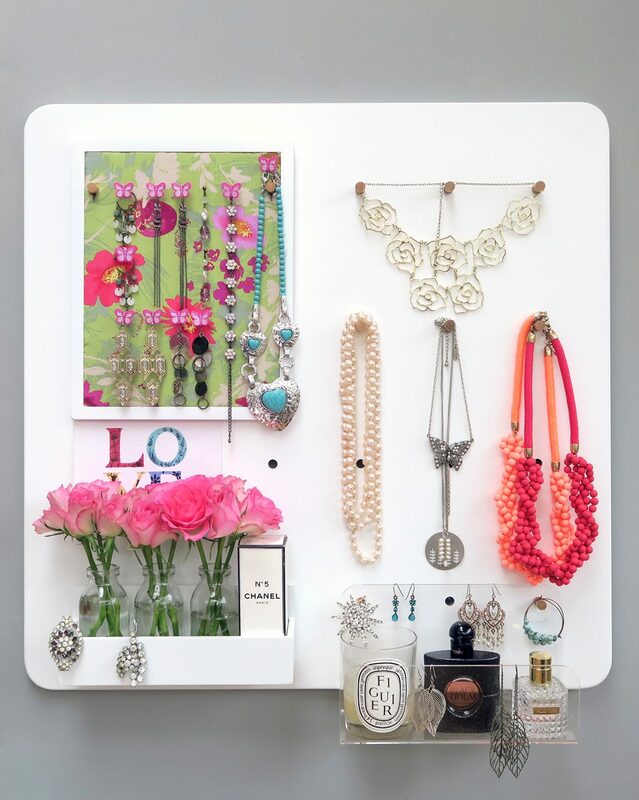 The pegboard comes with 13 little pegs — some of these were used for fixing the cork-board and ledges (perfect for housing perfume bottles and fresh flowers) — but the rest were excellent for hanging necklaces. To say I’m impressed with the pegboard is an understatement. It has so many fab little design features. 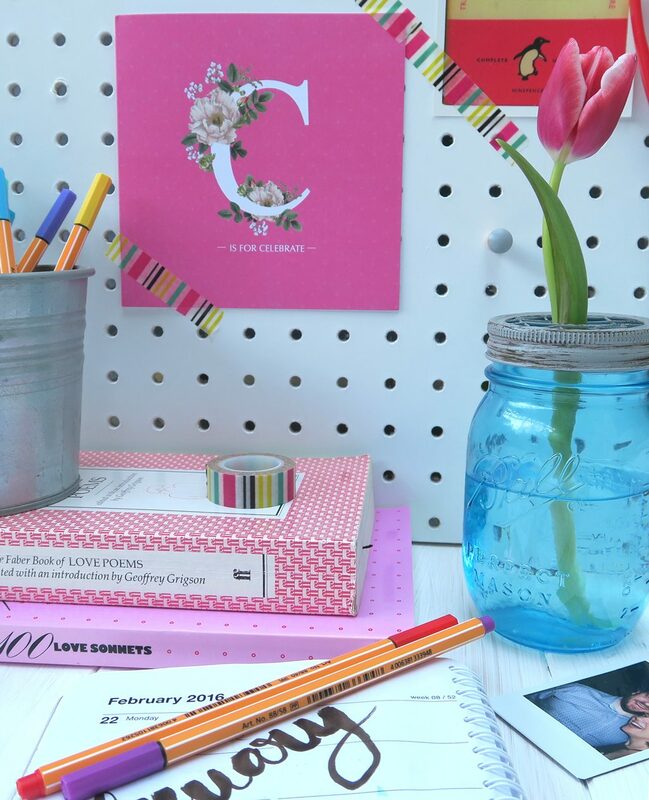 It usually costs £75 — which is almost double the price of my Block medium pegboard — but the quality is most definitely what you’re paying for and I think it’s well worth the price. It’s an impressive 60mm x 60mm and feels chunky and sturdy and I love the fact that it has boards, pots and shelves—included in the price — that you can reconfigure to suit your needs. Plus at the moment GLTC have a sale on at the moment and you can pick up this little beauty for a bargainous £37!! Hurry hurry!! You don’t want to miss out. I am proud to be a GLTC testing team member this year but all thoughts, words and images, as ever, are entirely my own. April been a hectic month already; the tiny boys have started pre-school — and we’ve upped their days to 4 long mornings a week — plus my in-laws are moving house. They’re downsizing from their large 5 bedroom family home to a 3 bed penthouse apartment. Contracts have already been exchanged, the removal men were in yesterday, the cleaners tomorrow and the new owners will take possession of the keys on Thursday. And breathe… I literally feel as though I was holding my breath as I typed that. I absolutely love moving house myself but it feels really weird for them to be doing it — almost like the horizon has shifted. When our own status quo is unsettled and things are new and unfamiliar, it’s always lovely to think we have their house as a safe haven. Solid ground, if you like. It’s definitely the end of an era; in so many ways. Really strange to think that we’ll never set foot in there again. I’m feeling excited and unsettled in equal measures. Needless to say, there has been a lot to do. My boy and I left the twins with my parents a couple of weekends ago and went down to help sort through the belongings that 62 years of marriage accumulates. Stuff to keep, stuff for charity — a LOT of stuff. We were lucky enough to be given some lovely things; framed prints for me and some beautiful books for him. The Reader’s Digest Complete Library of the Garden. As relevant today as the day they were printed. Which makes them the perfect heirloom for my gardening mad boy. Since we’ve owned our own home he’s always loved to garden; plus this year we took over a plot in the village allotment, so he’s got even more room to grow things. As a result, he’s been poring over magazines and books, planning a growing schedule, plotting his space. So these books are are such a welcome asset. Plus they’re absolutely gorgeous. 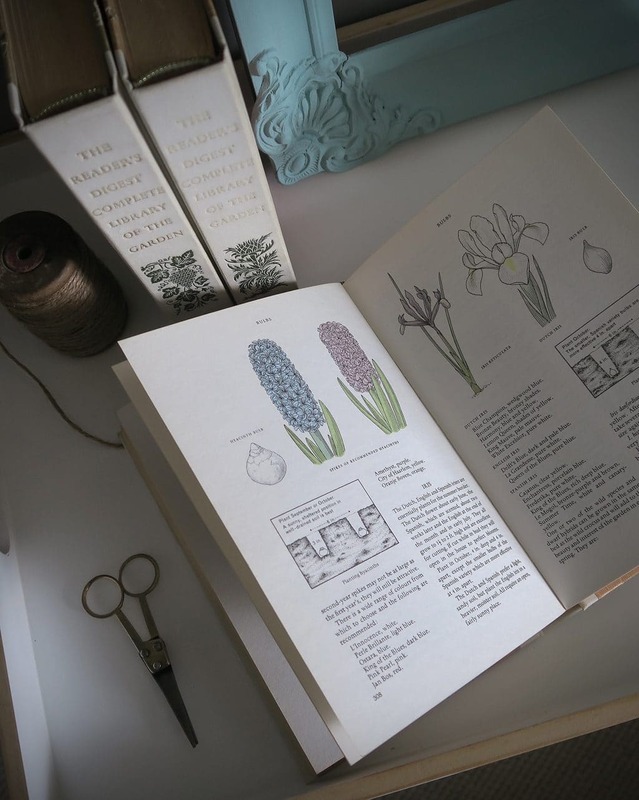 Beautifully bound with wood effect covers, pretty embossed spines and pages and pages of the loveliest botanical etchings. 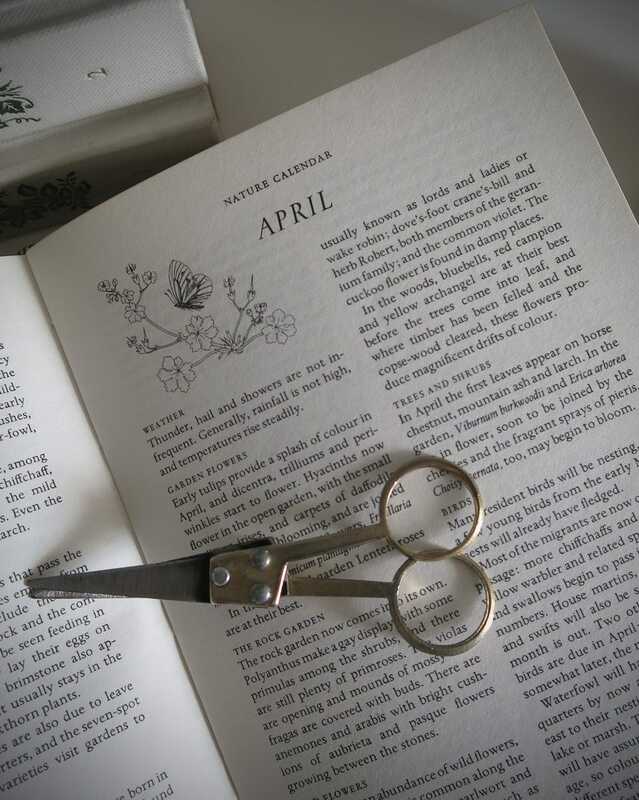 So my styling the seasons post for April is a little bit mixed. This month is bringing such a lot of change. Growth in our garden and allotment, change at home. New milestones for the Twinkles. A new and exciting era for my extended family. 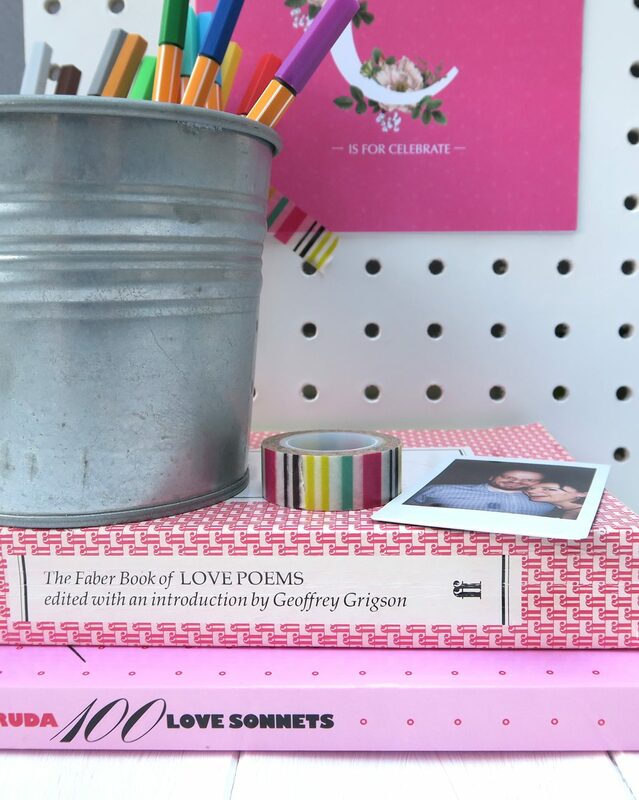 We’re embracing it all so this month I’m putting out the bunting and celebrating new beginnings. Last month’s styling the seasons post was late. Very late. So this month I decided to buck the trend and try and organise myself a little better. Although look — it’s 28th of the month and I’m only just posting once again. Oh. Although it’s been such a hectic month, I really should cut myself a little slack. Mother’s day, followed by my big boy’s birthday, followed by my little boys’ birthdays. Topped off with the long bank holiday, staying with family in Yorkshire for Easter this weekend. March is the busiest month of the year for us, by far. And celebrations aside, it’s a lovely month isn’t it? Full of promise and newness. 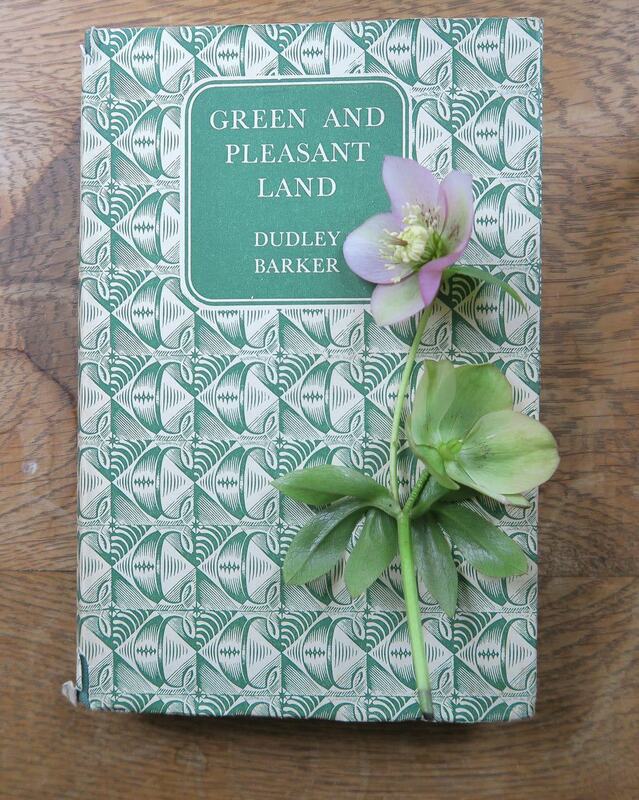 The fields are full of little hoppity-skippety lambs and the gardens and parks are beginning to rouse themselves, after the long winter sleep. 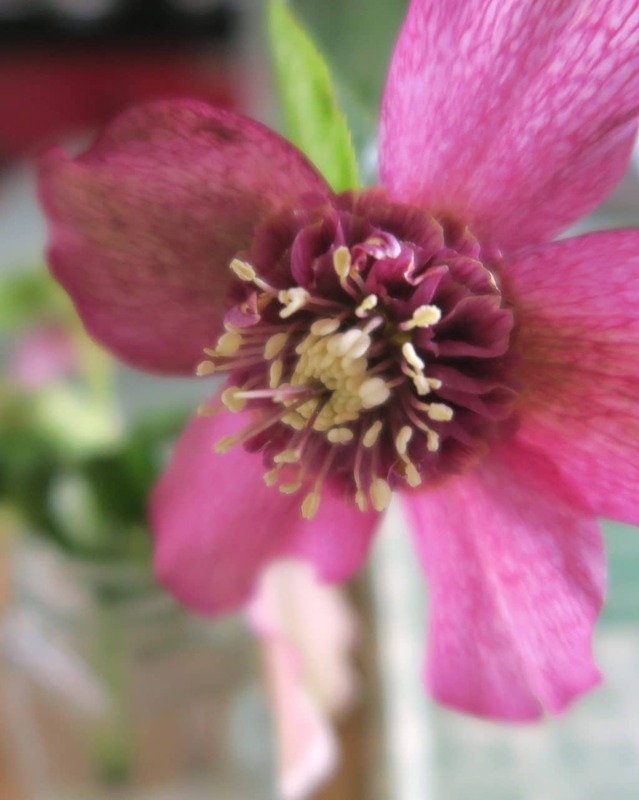 Talking of which, our own garden is springing to life and full of Hellebores at the moment. So beautiful. These gorgeous little plants flower in some of the shadiest corners of our garden, like little shining jewels in the darkness. I’m always so pleased to see them and look forward to their arrival each year, even though their presence is fairly short lived. They seem to disappear in late spring and we don’t see them again until the following winter. Although, having said that, I got really quite cross with them when we first moved here. 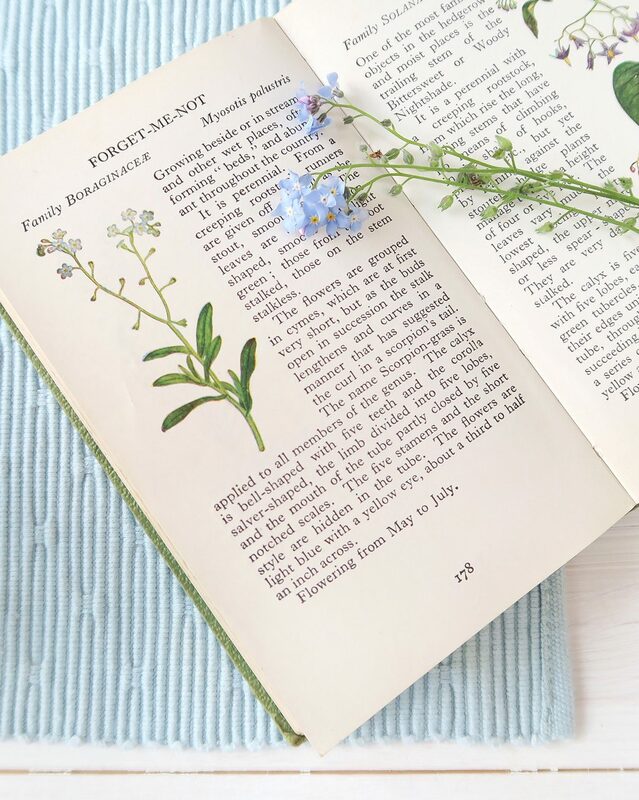 I was so delighted with my find, when I first spotted them, and began began to pick little posies to pop in jars and bottles but literally within hours they were dead. I was totally perplexed and couldn’t work out what I was doing wrong. Then a kindly, green-fingered, soul told me that you need to sear the stems before you put them in water. This will ensure that they’ll give a good display and will last a little longer than 60 minutes, once you’ve picked them! 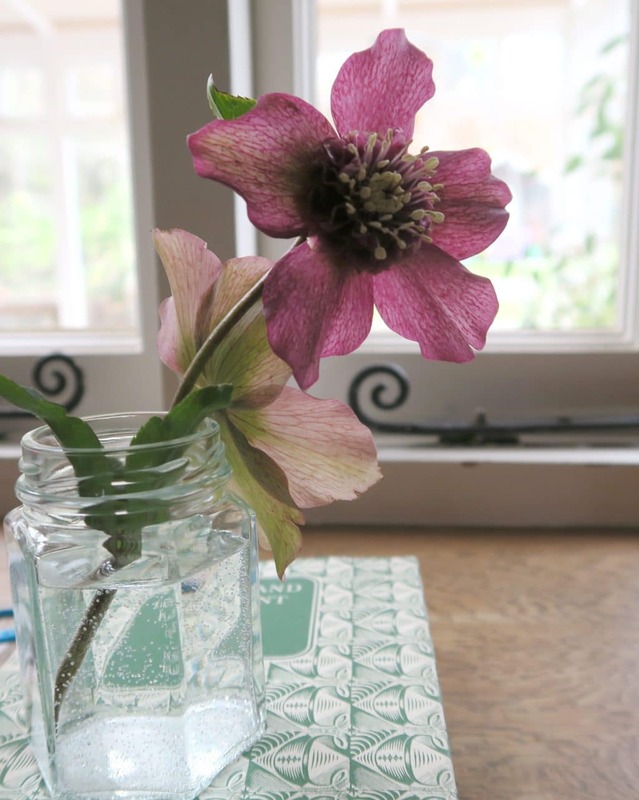 So this month’s Styling The Seasons post is an ode to the humble Hellebore. 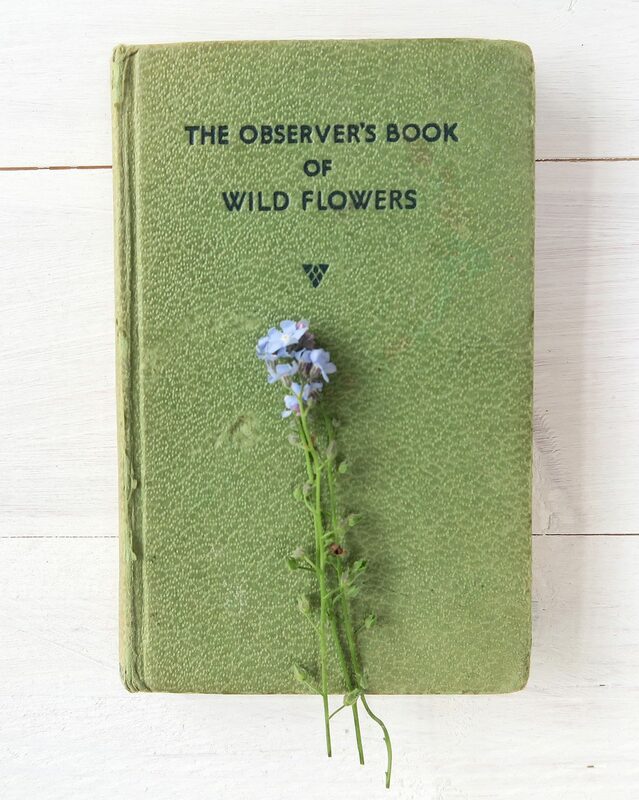 It’s a little bit of a cheat as I’ve not really ‘styled’ anything at all — more taken some pictures of the windowsill in our dining room — but I love the form and fragility of these darling little flowers. And I think the name of the book is very apt. It sums up our lovely country — particularly in spring. I had the very best of intentions for this month’s styling the seasons post. I’d bought some beautiful Muscari (otherwise known as Grape Hyacinths) — in a glorious sky blue shade — and popped them in a cheerful turquoise glazed pot, in readiness. I’d envisaged them sitting on my kitchen table on a stack of pretty cookery books but, as ever, things rarely go to plan. February threw us a curve ball in the form of flu — for me and my three boys — and as our routine was so monumentally thrown out of kilter, I’ve spent the last few weeks chasing my tail and trying to catch up. Needless to say, by the time I got around to shooting my pretty little friend, it’s juicy plump flowers had dried out and lost their vivid blueness and the sturdy stems had wilted and bent with the weight of the blooms. Note to self: try to shoot florals when they’re looking their best. 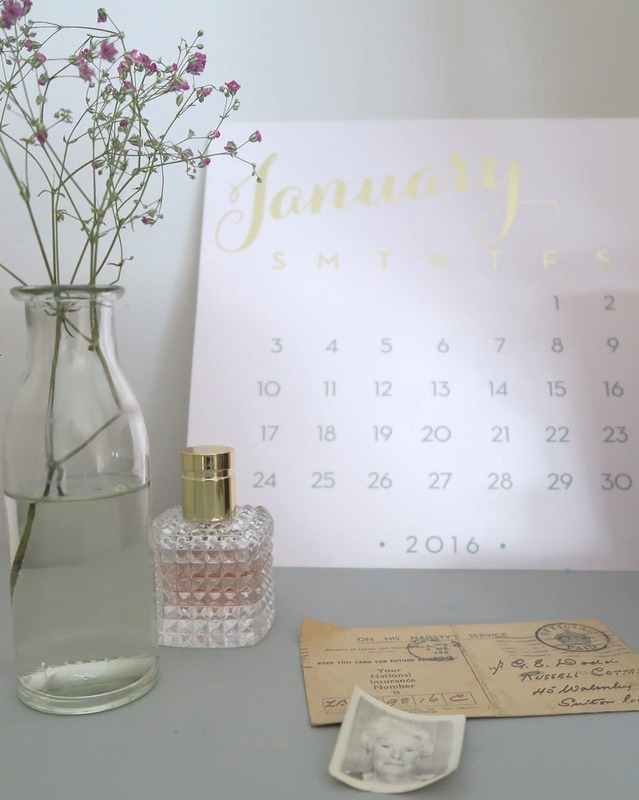 Anyway, desperate to stick to my resolution of joining in with Styling The Seasons this year ( a lovely blogging series founded by Apartment Apothecary and Lotts and Lots) — and not fall at the second hurdle — I’ve resorted to taking a few pictures of my desk instead. It’s a view that regularly changes, as my pegboard often features ephemera pertaining to that month. Cards I’ve been sent — or tickets and other items that catch my eye — and there always seems to be a rotation of books, depending on what I’m working on at the time. 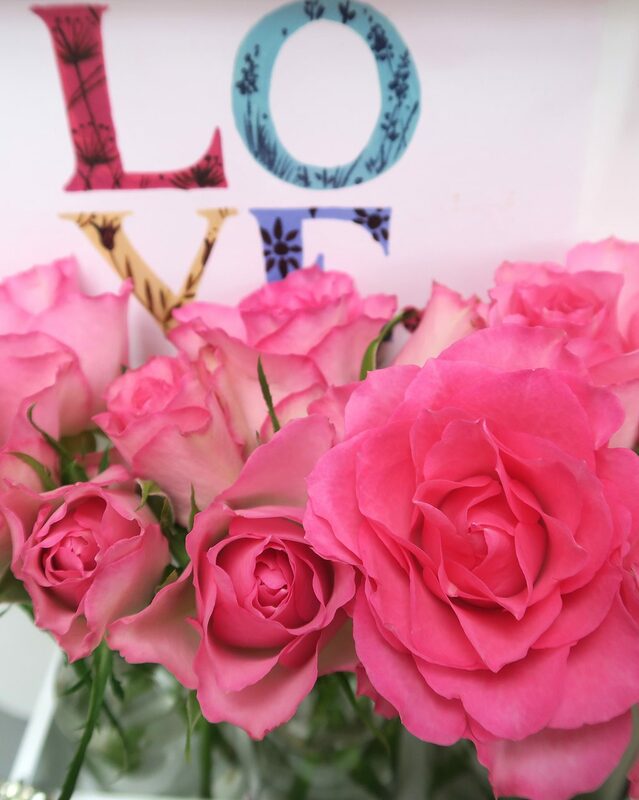 So whilst February has been germ ridden, it’s also been a month of love and celebration. 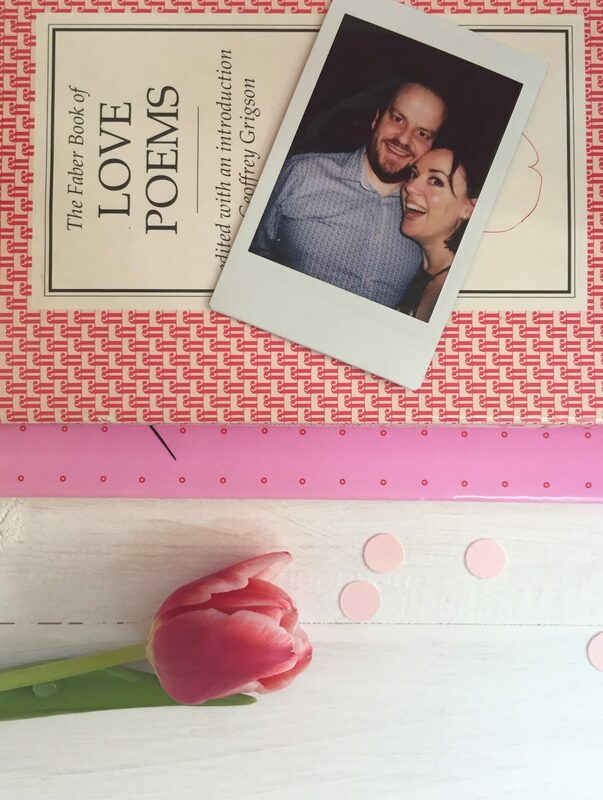 My boy and I were married in February and this year we celebrated our fifteenth wedding anniversary. We hot-footed it off to a lovely hotel in The Cotswolds. It was the weekend that Hurricane Imogen hit British shores, so the weather was foul but we had the best time; reminiscing and celebrating our happy union. I’ve also been working on some new prints and sought inspiration from a couple of love-laced books. So this post is not much styling the seasons — as there wasn’t too much styling going on here — but it is a very good reflection of the month. So we’re almost at the end of the first month of the year — January is nearly at a close. What does this month mean to me? Well, in a few days time it will be my birthday. It’s funny, I’ve always moaned about being born a month after Christmas. 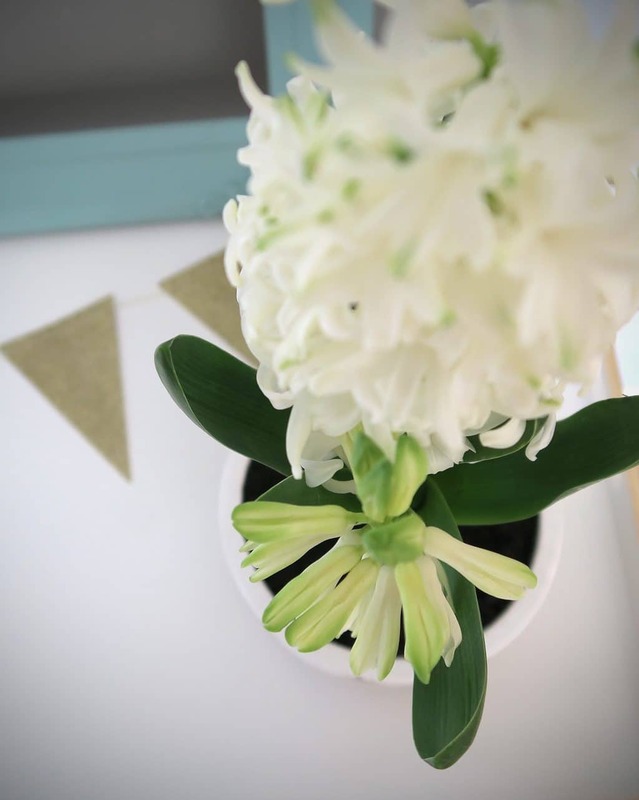 As a child I felt sad — and a bit cheated — not to have a summer birthday; parties outside in the garden and long, light days, enabling the birthday girl (or boy) to enjoy their special day for just that little bit longer. But as an adult, I feel grateful that I have something to look forward to, during one of the greyest and — let’s face it — depressing months of the year. That said, January is a time for renewal and change. And that’s got to be a positive thing. The days are beginning to lengthen ever so slightly and, in our garden, the bulbs are starting to boldly sprout, little green shoots. I’m definitely one for living in the moment but, in January, I can’t help but look forward to spring. 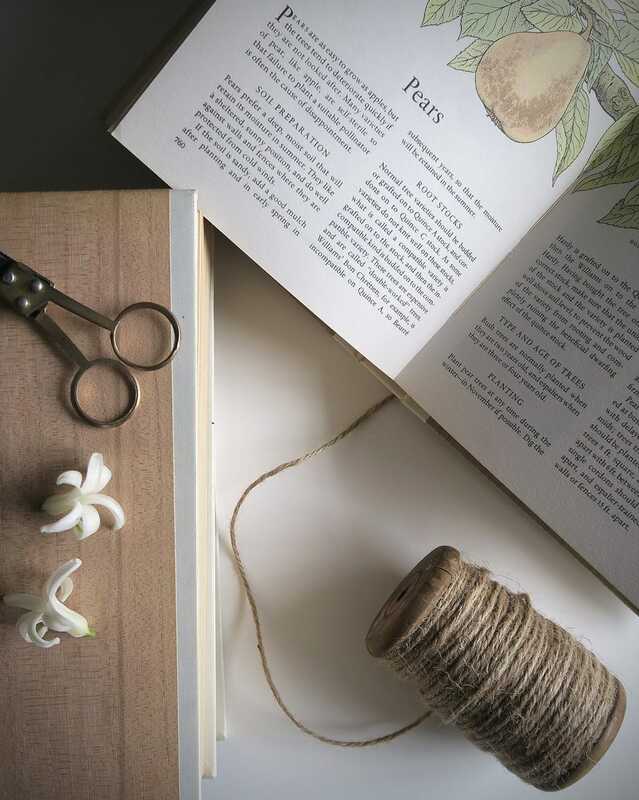 Last year, my friend Rachel — who writes at The Ordinary Lovely — joined in with a blog series called Styling The Seasons; run by Katy (Apartment Apothecary) and Charlotte (Lotts and Lots). Every time she posted one I’d say ‘Argh — I keep meaning to join in with this!!’. And the following month I’d forget. Well, in this years resolutions, I said that I wanted to do more making and doing posts — and I also said I’d plan better — so here I am. Doing and planning, with my first Styling The Seasons post. And, as I’m in a reflective mood — for my first attempt — I have found a corner of my home with the most reflective thing I own. My granny’s mirror. 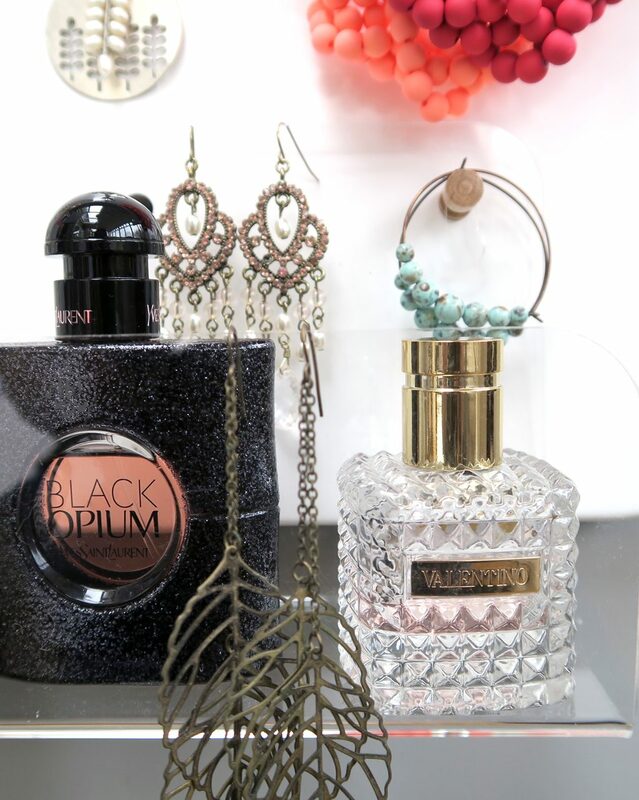 I’m not a natural stylist, that’s for sure, but I love this little collection of items. All serving to remind me of my family. And also to remind me that — even though it’s a grey and dismal month — January is a time for celebration. I’ll be another year older (some may say that’s a bad thing but anything that gives you a genuine reason to drink Champagne and eat cake should be celebrated)! Plus spring is just around the corner. And that’s definitely a reason to put out the bunting, if nothing else.